The Correlation Tool is an optional function supplied as an add-in to the standard measurement software. The tool calculates the correlation between a current measurement plot and a reference plot (from an earlier measurement) based on the mathematical definition of cross correlation of two functions. Typical applications of the Correlation Tool include testing of manufactured components against reference measurements for quality control (QC) purposes, or tracking of frequency shift in sensor applictations, etc.. Implementation of automated correlation routines and related data processing is possible as part of our customized add-ins development services. 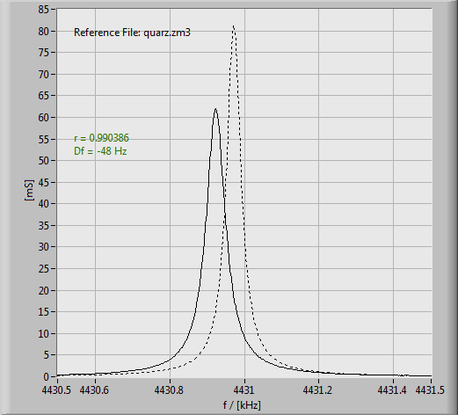 Do you want to know more about the Correlation Tool for the SinePhase Impedance Analyzer software? Please feel free to send us an e-mail, contact form, or just call us.